This recipe for Dark Chocolate Orange Pudding is simple, yet decadent. It features 3 types of chocolate and a hint of orange, proving that pudding is not just for children. Let’s get the first week of the Holiday Recipe Exchange kicked off with our chocolate recipes! Today I’m sharing a scrumptious Dark Chocolate Orange Pudding recipe. The combination of chocolate and orange makes my taste buds sing. Orange has long been my favorite flavor to pair with rich, dark chocolate. 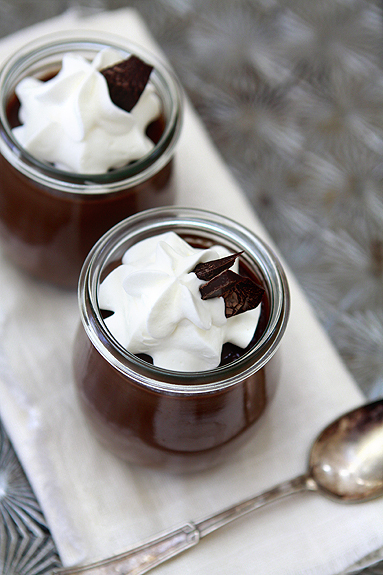 High quality chocolate is the key for rich, flavorful chocolate pudding. I choose Scharffen Berger Chocolate to make my Dark Chocolate Orange Pudding. Because I know that their chocolates feature only the finest beans available. Scharffen Berger Company was founded in 1997 by Robert Steinberg and John Scharffenberger. They search the world for the very best cacao beans. If you haven’t used their chocolates yet, give them a try. I know you’ll be impressed! This silky smooth dark chocolate pudding is enhanced with three types of Scharffen Berger Chocolate: semi-sweet, unsweetened, and cocoa powder. Dark Chocolate Orange Pudding definitely proves that Pudding isn’t just for little kids. This recipe is a cinch to prepare, but presents itself beautifully at the holiday table. I hope you love it as much as our family does! Check out Jamie’s Chocolate Caramel Tarts that she made for the launch of the recipe exchange! Chocolate and caramel are another favorite flavor combo of mine. What is your favorite flavor to pair with chocolate? This silky smooth dark chocolate orange pudding is enhanced with three types of Chocolate: semi-sweet, unsweetened, and cocoa powder, proving that Chocolate Pudding isn't just for little kids. Combine the sugar, cocoa, cornstarch and salt in a medium sized saucepan. Slowly whisk in the eggs, egg yolks, and milk. Heat the mixture over medium-low heat until bubbling. Stir in the semi-sweet (or bittersweet) chocolate and unsweetened chocolate. Continue to cook over medium heat until the mixture comes to a boil, stirring constantly with a whisk. Be sure to scrape the sides and the bottoms of the pot as you whisk. As the pudding cooks, it will gradually darken and thicken. Reduce the heat to medium-low and cook while gently stirring with a wooden spoon. After 1 – 2 minutes, the pudding should thickly coat the spoon. Stir in the butter, vanilla, and orange oil. Transfer pudding to 6 small bowls or jars. Cover the surface with plastic wrap as it cools if you do not wish for a skin to form on the top of the pudding. Cool for 30 minutes at room temperature, and then transfer to the refrigerator for about an hour, or up to 2 days. 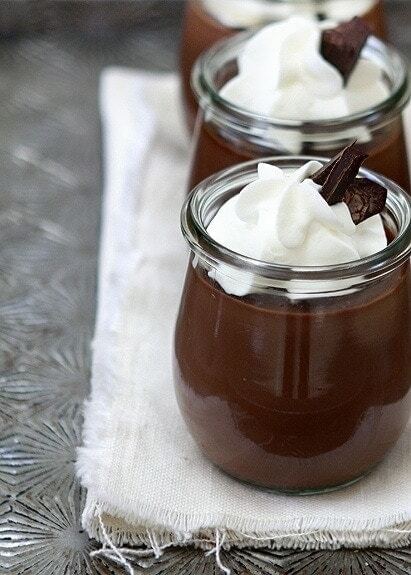 Serve with a dollop of whipped cream and chocolate shavings. Write and post a recipe on your blog featuring CHOCOLATE . Include “Come join the fun at the My Baking Addiction and GoodLife Eats Holiday Recipe Swap sponsored by Scharffen Berger.” in your blog post. Add your link to the widget on either GoodLife Eats or My Baking Addiction (we have the same widget code, so only add it on one site). Submit your post before Oct. 10, 11:59 PM. More detailed info are available here. Love any of the recipes featured in today’s Holiday Recipe Exchange? 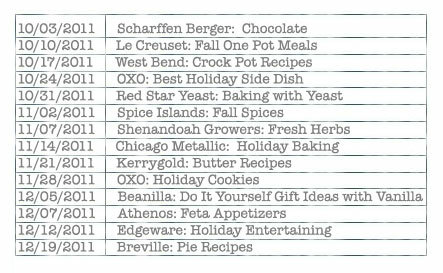 If so, be sure to to use the Ziplist Web Recipe Clipper to add your holiday favorites to your online recipe box. $150 Scharffen Berger Chocolate Gift Basket (1 winner). Prize provided by Scharffen Berger. All of these chocolates in the prize will be perfect to experiment with AND to make a batch of this Dark Chocolate Orange Pudding!